I don't hate winter. In some ways, I even love it. Cold-weather means I get lots of time indoors to plan and do all my prep-work to have a great homestead year. The problem is, as soon as my seeds start arriving and the days begin to lengthen, I get a severe craving to grow stuff. Yes, I can plant seeds for onions and things like artichoke and hibiscus that need an early start. But that takes weeks of waiting, and I want to play in the garden now! So, this is about the time of the year when I start creating moss scapes indoors. Yep. 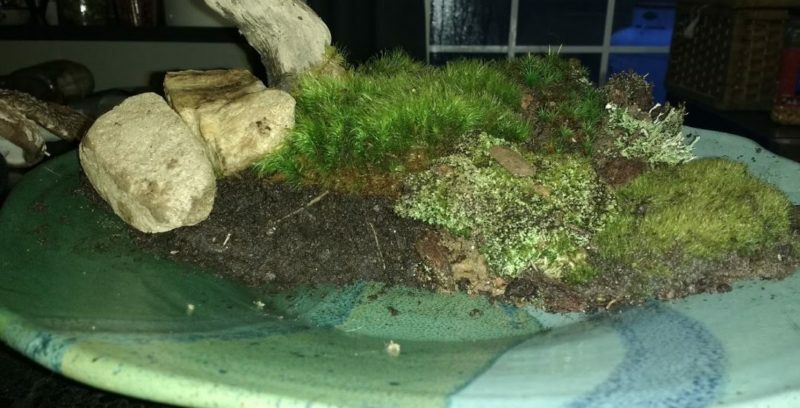 I make moss landscapes to grow inside my house. They give me a reason to get outdoors for a while to gather moss. They are super easy to make. Moss scapes take very little maintenance. Plus, they give my green thumb just enough of a workout that I don't go stir-crazy waiting for spring to arrive. 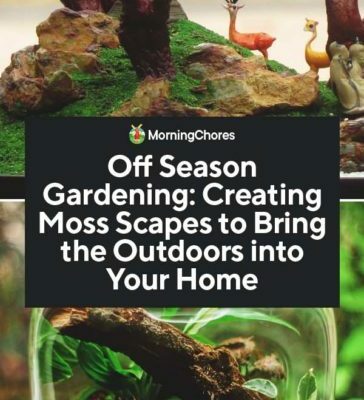 If you are looking for an easy way to satiate your craving for the growing season, why not try creating moss scapes at home? If you have some forest areas around you, you likely have a ready source for free moss. Moss hunting makes for a great reason to get outside even when the weather is less than spring-like. Moss doesn't have roots like regular plants, so it tends to locate itself in areas where the soil is exceptionally moist or where water flows nearby. For example, around decayed tree stumps or on the North-side of long-fallen trees are great places to look. Shady areas where water runs at times, like the edges of dry creek beds or sloped pathways, also tend to gather moss. Walk slowly and look for flashes of green growing near to the ground. Moss is easier to spot in winter when very little else is growing. You may even have walked past moss patches a hundred times in warmer weather and never noticed them before. Several kinds of moss grow all over in the woods in my area. But, I only harvest from large patches. Small patches of moss are just getting started and need strength in numbers to continue growing and spreading across the ground. So, I leave those small colonies alone. Mossy areas that cover a couple of square feet or more are already well-established and won't be bothered if I harvest a bit. I usually take no more than about 10% of any given moss patch. Also, I like to take my patches from the center rather than the edges, so I know the moss will fill back in quickly. To harvest, you can use your fingers to pry the moss off the ground. It's kind of like rolling up a rug. Make sure you get all the way underneath the moss. Then carefully work your fingers further underneath until you have a good chunk. Finally, work your small patch of moss loose from the rest of the patch. You can bring a tray or basket to set your moss in for transport. 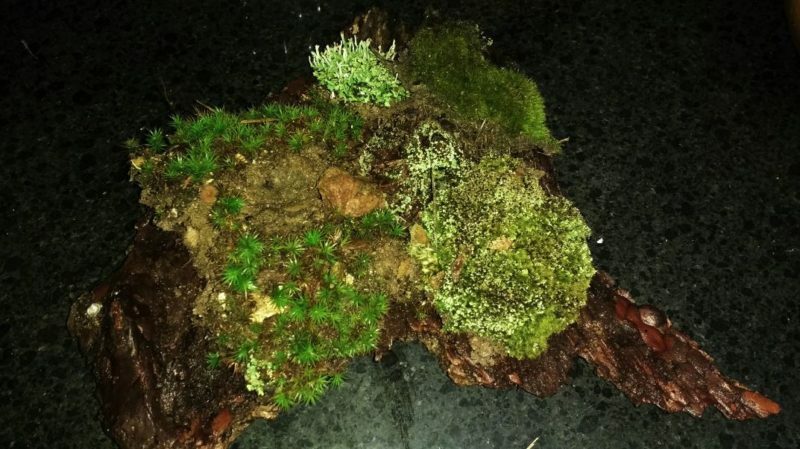 I usually grab a bit of bark from a decomposing tree to use as my moss tray. 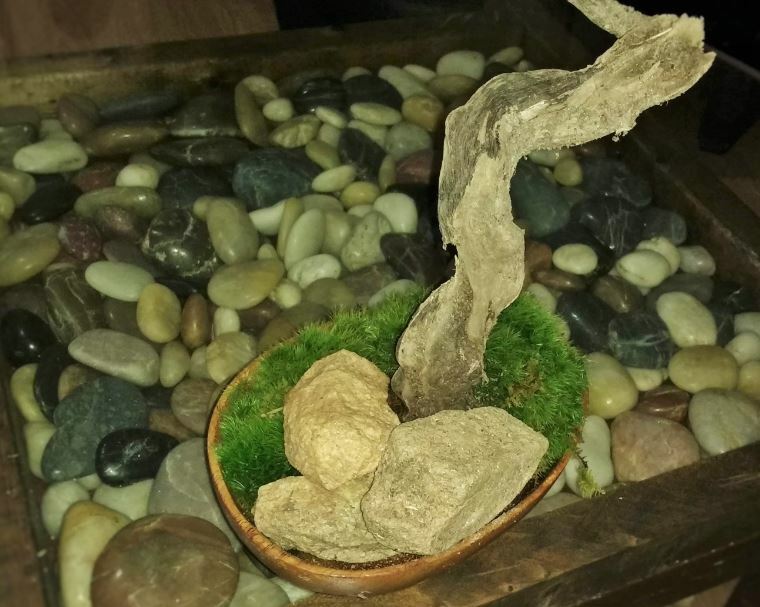 While you are at it, gather some rocks and interesting twigs and branches to use for your moss scape. You can even include bark or wood bits covered with lichen for more interest. This is your design, so pick up whatever natural materials appeal to your aesthetic sensibilities. 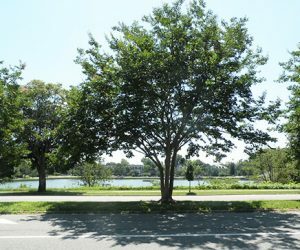 National, state, and private parks often have regulations about removing natural materials from their grounds. Make sure you check for details and comply with applicable regulations. Private lands (that you have permission to be on) are often the easiest place to gather moss for your project legally. However, make sure the moss you remove is abundant and only take what you need. Some mosses are endangered and need our protection. If you live in an area that is short on free moss, or you can't get outside to harvest, you can purchase live moss from reputable retailers. Similar to buying live plants, there are a lot of farms out that grow moss for garden use. Usually, a few plants are all you'll need for creating moss scapes for indoor use. For ecological reasons, make sure the moss you buy is grown for consumer use rather than wild harvested. Wild moss has been over-harvested for craft use in recent years. So, unless you can see with your own eyes that the moss is plentiful, choose farm-grown instead. The hard part is done. You've been outside, rounded up your moss, and some other decorative materials and now need to bring together a few more details. Unlike many other plants, you don't have to worry so much about drainage and good soil for moss. It feeds on specks of dust and holds water in its leaves. That means you can use a large variety of container styles as the base for your design. I like to use plates that have a slight bowel shape to them. Pottery, particularly in earth and sky tones, really appeals to me. But you can also use slabs of bark, wooden bowls, plastic containers, trays, glass jars, and more. You will need to keep your moss moist. So whatever surface you choose for creating moss scapes, make sure it's easy to water the moss. For example, if you want to make a terrarium using moss, vessels that open at the top, so you can water the moss from above, are usually easier than trying to water in a jar that opens on the side. However, you can get tricky and use spoons to moisten your moss in sideways oriented terrariums. As I said, you don't need good soil for growing moss in your living room (or other parts of your house). However, you do want something for it to attach to. Moss holds itself in place and spreads using rhizoids. These are kind of like tiny anchors that set themselves in soil, on rocks, or other decaying matter. I use partially decaying wood chips or leaf mulch as my substrate. This creates a similar growing environment to what the moss seems to prefer outdoors. I usually scrape some off my perennial planter beds when I need it. You can also use low-fertility soil for this. The key is that you don't want too much nitrogen in your substrate. 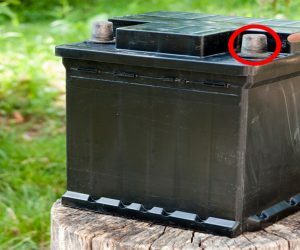 Partially decayed materials have most of their nitrogen still locked up. So, that's why they work well. 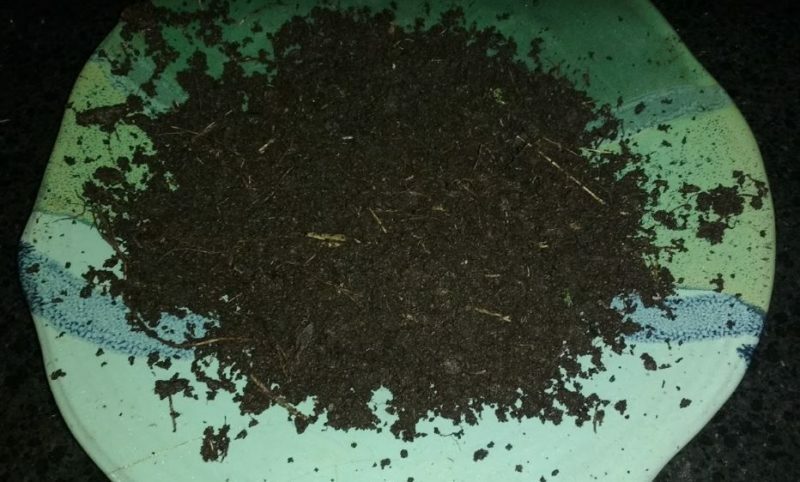 Extremely aged compost (e.g. hummus) also works well. Don't use the fresh stuff though, that still has too many nutrients. Pebbles and rocks also work. However, since they naturally promote drainage, you'll need to water your moss scape more. Plus, you'll need to plan to either empty the excess water or use planters with drainage holes to avoid having stagnant water. In addition to any natural decorative items you collected with your moss, you may also want to add some other decorative details. For example, I like to use some polished stones and glass to give a more structured look to my moss scapes. 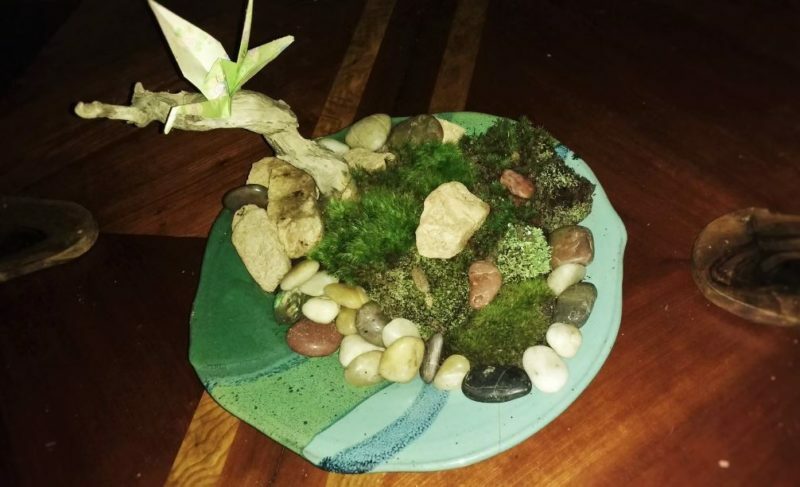 Small figurines such as a glass tortoise, origami, beautiful buttons, glass works, unused jewelry, and more can all be used to add personal style to your moss-scape. Similar to adding pretty bird boxes or pollinator hotels, or benches to an outdoor landscape, small details make your indoor moss scape more authentic and personal. Now that you have your materials ready, it's time for creating your moss scape. Use your substrate to create a shape on your landscape surface. Pile it up in mounds to add height or spread it out to make low areas. 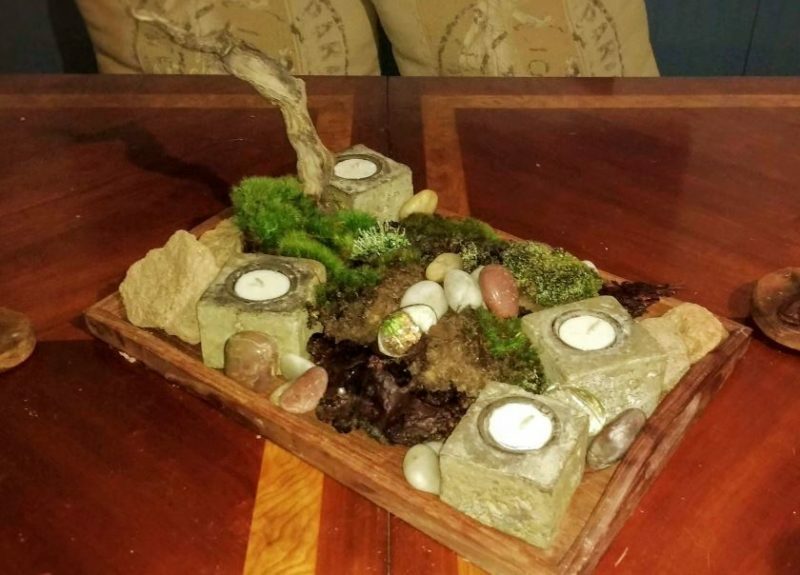 Use rocks, or decorative items to add drama. Intermix your mosses to create a patchwork effect. The outcome depends on what you like and the materials you have to work with. Feel free to play around. Since moss doesn't root, you can lift it and adjust it as much as you need to until you achieve the look you like. Once you have settled on a design, saturate your moss with water. Then, put your moss scape in an area that has a little bit of sunlight. You don't need much. Mosses can survive even in the dark of the forest floor. “Care” might be an overstatement. About once a week, feel your moss. If it's a bit dry, saturate it with water. Don't drown it! Basically, you want it to be about like a wet, but not soppy, sponge. If you decided to create a moss scape at the base of your bonsai tree, you can gently spray it with a water bottle at the same time as you would spray your tree. If your moss scape starts to look unhealthy, try moving it to a different location. It usually just need a little more or less light. Feel free to move your moss scape periodically just for fun. Put it on your dining table for dinner parties as part of your table-scape. 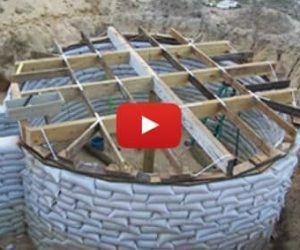 Move it to your office to keep you company while you are doing all your homestead planning. Give it a little fresh air out in your garden or greenhouse once in a while. If you get tired of your original design, feel free to take it apart and make another. Moss doesn't mind occasional transplanting. Just give it a few weeks to recover between designs, so it doesn't become stressed by constant change! If making indoor moss scapes has given you a desire to start moss scaping outside, consider adding moss to your outdoor designs as well. You will need a lot more moss, but the basic concepts are the same. Moss has been around for more than ten thousand years. They tend to be hardy, tolerate shade well, and offer evergreen interest in winter gardens. Once you have a little experience growing them indoors, learning how to use them in your outdoor spaces is no problem! I hope this excursion into creating moss scapes will help curb your craving for gardening and get you through to spring. I also hope your moss gathering experience led to an appreciation of all the amazing lifeforms that come together to create a working eco-system. All the lessons you learn from observing and interacting with natural systems will help you build your gardening skills even during the off-season!